From the designer of the Filmography of Cars infographic comes the sequel, titled The Filmography of Aircraft, created by Cathryn Lavery. 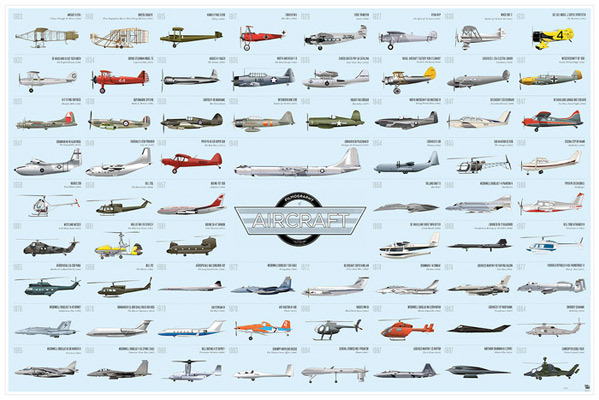 "A giant print illustrating 100 years of Aviation in Film. Through 66 intricately detailed hand-illustrations, we’ve charted the iconic aircrafts of film from 1903 to the modern day. From the early 1900s Wright Flyer to the Tomcat in Top Gun - we have it all covered." This brand new chart, which contains over 60 craft, is also being funded through Kickstarter (thanks to @emmafgreen for the tip) which includes a prize option of the detailed research book for all of the planes. Take a look below. This has everything from Con Air to Airplane to The English Patient to The Expendables. Lavery is looking for a total of $3000 by May 23rd, and she's already hit that goal easily. You can still order a print of this infographic, or more from the Kickstarter page, along with more details. Why do the airplanes on this look so good? Because she hand drew every single one of them full-size. "I spent hours, and yes sometimes even days, on each aircraft, meticulously crafting each detail. Each aircraft was sketched by hand before being converted to a digital illustration. By drawing each plane at large size (approx 10" x 18"), I was able to get the detail I wanted in which I feel comes across in the small scale." Impressive. Nice work, Cathryn, I dig it. No more Kickstarter for me. Too many broken dreams.